Ever since people started making different mods and special maps in Warcraft 3, I always found the tower defense genre appealing. They were relaxing yet always chaotic in an enjoyable way. It always requires some strategic planning when you are building your own maze of destruction with limited resources. Up until I had heard of Defenders of Time, I was surprised no one had made this idea into a more full-fledged multiplayer experience. I have seen small games here and there, and mainly on the mobile phones, but Defenders of time is trying to show us that a Tower Defense game can be pushed beyond a simple minigame. If you’re not familiar with the concept of a tower defense let me bring you up to speed real quick. 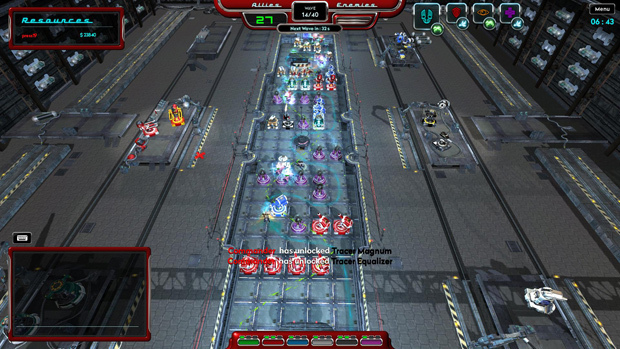 In this game mode you are thrown onto a random map, and on this map there will be a portal where monsters and other type of creatures will spawn. 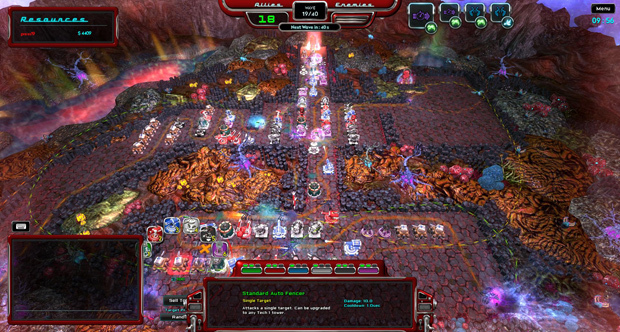 These creatures will follow a specific route until they arrive at their destination; the destination is usually the key object that you as a player need to defend. 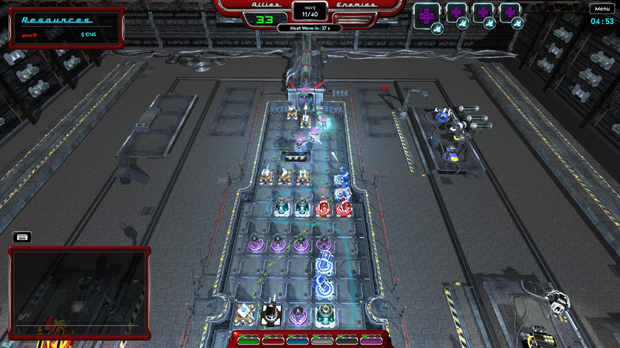 While it’s usually a solitary experience, in Defenders of Time you can play with up to eight players at the same time. As a tower defense veteran, I couldn’t wait for the challenges that would be unleashed with the intention of taking out such an organized force of tower builders. As I mentioned before you will have to strategically plan on each map so you have the most optimal damage output to stop the alien invasion. When you are playing alone, you have the complete freedom to build over the whole map, so you can start building your maze however you see fit. Since the aliens will follow a specific route, and both land and flying aliens have a different path you will want to make both paths feel as long for the invaders as possible. This is done with delay tactics that give you extra time to blast each alien passing by. You start with 50 lives, and each monster that arrives at the objective brings your total lives down by one. So you aren’t completely lost when a couple aliens sneak through, but obviously after each wave the aliens get tougher and stronger, so you know you are in trouble if the early weak aliens are already witling away your life force. This is where the currency and tactical upgrades come into play. The aliens come and go just like the sushi in a sushi bar. The break between waves is almost non-existent so you need to know exactly what you’re going to upgrade and how much you can upgrade while aliens are still on the attack. At the start you are given a small capital of gold to start building your turrets to estimate what the key choke points will be on the first wave. 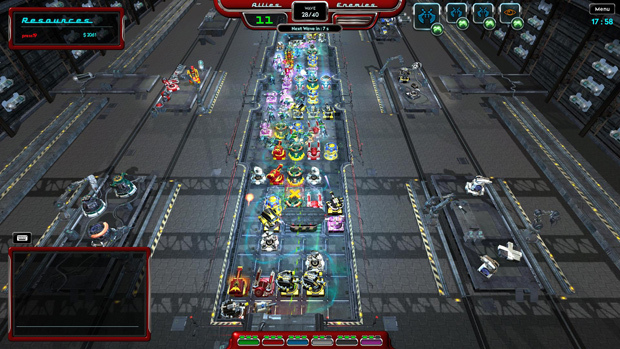 You have much more freedom of what to build and where to build it compared to most other tower defense games, which adds to the challenge as the possible number of errors and non-optimal decisions has been increased as a result. Some maps are best dealt with by creating straight horizontal lines of turrets while others favor vertical and even diagonal layouts. Even with my considerable experience, I found even the tutorial and starter levels to require a bit of critical thinking to overcome. Since you are barely given any time between the waves, it is a constant massacre and you will have to quickly upgrade all your turrets and extend your maze as fast possible. Luckily there seems to be a turret fit for every occasion and challenge once you get the hang of using them. You will start the game with normal turrets to keep the learning curve bearable, and more open up as the commander introduces them. 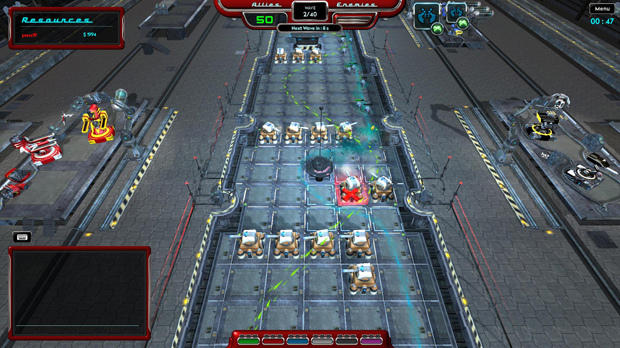 You are then able to upgrade the turret into six different turrets. These turrets also have special effects that can slow the aliens, or deal huge amounts of damage in either a splash zone, or as rapid-fire single target. You can also build turrets specifically made for flying aliens, and also turrets that detect the invisible aliens. You will need to use all six of these turrets one way or another, and since you are trying to make a big maze, you will have to be tactical when placing each and every turret to create a balanced maze that’s ready for anything, or stacked in one direction to match the opponent’s army. After a while you will be able to upgrade these six turrets once more to branch out into new tech trees, and after this upgrade you will be able to upgrade them even further to a final tier. You obviously want to slow the packs of monsters down, while bringing epic splash damage upon their heads, and at the end you might throw down the long range turrets that deal a lot of damage to a single boss target or snipe down stragglers that somehow got past your core turret barrage. After a few hours of playing I felt a few things were amiss in Defenders of Time. First of all the game is definitely not the greatest looking game, and honestly it looked rather dull when compared to some Tower Defense games you can find on your phone. The Turrets specifically feel boring, and you usually end up having to spam all of them which left me kind of confused for the first couple hours about what exactly the purpose of each was. The tech progression as well seemed rather railroaded into one optimal route while punishing creativity in taking other directions. Defenders of Time still has a long way to go, they definitely are on the right track with the frantic fun that massively multiplayer game modes can offer, but their map design and turret progression needs some serious retooling.